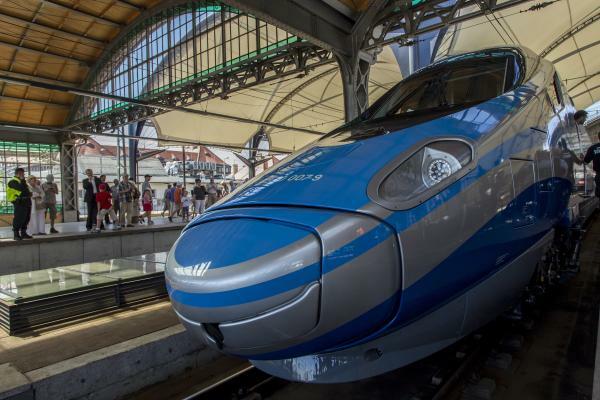 The first of twenty high-speed Pendolino trains purchased by Polish State Railways (PKP) has been delivered to Wroclaw, south west Poland. 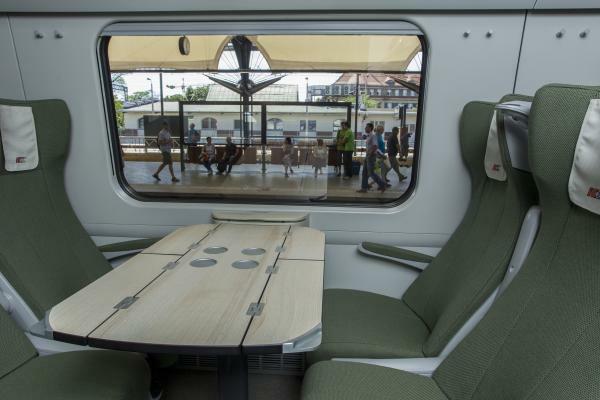 The train, which was made at the Alstom factory in Savigliano, Italy, is part of a programme to reduce journey durations between key Polish cities. Each train stretches to about 190 metres (623 feet), comprising of seven carriages, divided between first and second class. All in all, 402 places will be available on each train. At present, the maximum speed on Polish tracks is 160 km per hour. In theory, the Pendolinos can reach speeds of 250 km per hour (155 mph). However, modifications need to be made to Polish tracks, and the speed of the vehicles will be increased gradually, over several years, beginning at 200 km per hour. After a presentation at Wroclaw station, the train will be removed to Zmigrod, where tests will be carried out later in the day. Members of the public should be able to take advantage of the new model as of December 2014. Estimated journey times include 2 hours and 40 minutes from Warsaw to Gdansk, 2 hours and 15 minutes from Warsaw to Krakow, and 3 hours and 30 minutes from Warsaw to Wroclaw. PKP Intercity purchased the trains in May 2011, and construction alone cost 400 million euro (US $531.76 million). The running costs of the trains for the first 17 years amounts to 265 million euros (US $352.29 million). 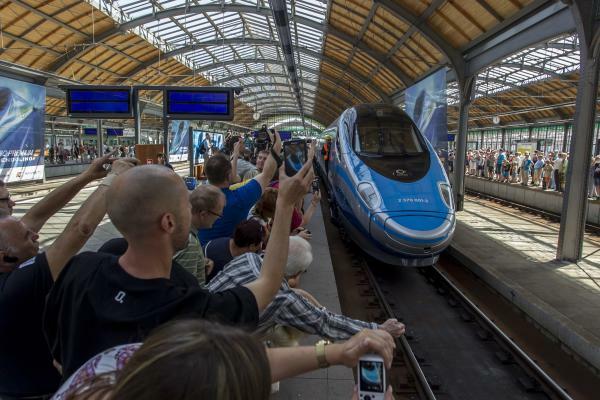 A Pendolino train arrives during a presentation at the train station in Wroclaw, Poland, 12 August 2013. The Pendolino will bring about a revolution in railway transportation in Poland. A trip from Warsaw to Krakow will take 2 hours and 15 minutes, shaving off 1 hour from the current journey time. In Poland, the Pendolino train is named EIC Premium (Express InterCity Premium). 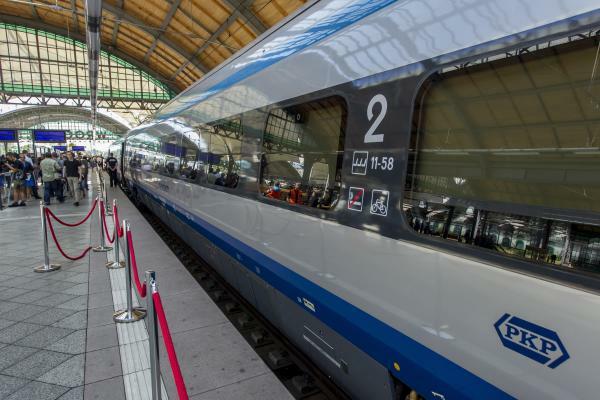 The Express InterCity Premium trains will start to run on the Polish network from December 2014 and will connect northern and southern Poland, linking the Tricity, Warsaw, Cracow, and Katowice. EIC Premium is a seven-unit self-propelled train. It is 187.4 metres (614 feet) long with a maximum operating speed of 250 km/h (155 mph).